Nice contact, going right, in a bigger gait. We’ve been working on establishing a better quality “default” working trot – specifically, tracking up and staying in front of my leg. 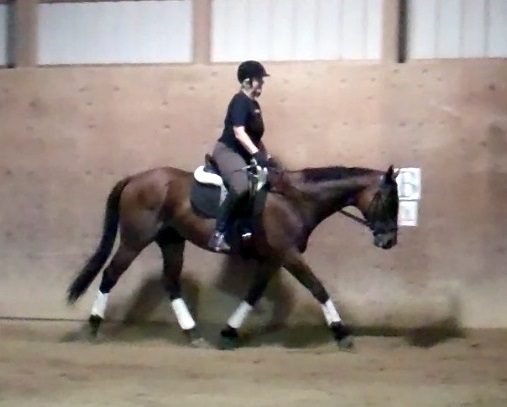 And overall, we’re doing much better work, and I’m able to generate good quality gaits pretty much from the get-go. There are two keys to our improvements – my staying balanced on the horse, and insisting upon a good forward response when I ask nicely. Tonight a few other things happened – as the quality of the trot improved, I could feel Derby’s back come up nicely, and the contact really improved. And watching the video after the ride, I can see that his mouth is a bit quieter and he’s a lot steadier in the bridle too. Best of all, however, I could feel Derby really engaging his hind and pushing forward. That feeling of power is amazing. Speaking of the video, here it is. We were working on a few things – maintaining the quality of the gait, while also keeping Derby (and me) balanced and not falling inward – at one point you’ll hear Christy say “shift out” which means she wants me to get some weight into my outside stirrup and push the horse outward. And late in the video you hear me say “Boosters!” – it’s at that point I felt Derby finally start to push. 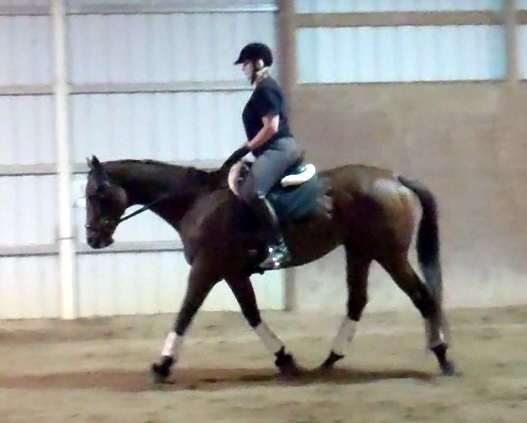 We drilled big trot / little trot and then did some canter work that wasn’t fabulous. I need to work on staying balanced in the transitions, and also reinforcing immediacy with Derby. This will come. LIttle trot. His back is up and he's holding the contact nicely. Now I have something else to confess. Last night I rode Tucker, the very fancy, very small (15 h) Quarter Horse. 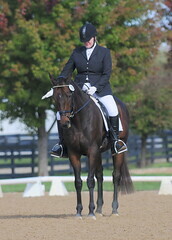 Tuck has a ton of training and is light and responsive to his rider’s shifts in weight, balance and posture, and aids. He was the perfect mirror for me last night, and the reflection wasn’t pretty. It took me a while to figure out how to ride him – his short legs move a lot faster than Derby’s, and the tempo of his trot is a lot faster. At first it made me laugh but within a few minutes, I apologized to Tuck for laughing at him, and asked him to please stop humbling me. I want to do a few more rides on him because he forces me to stay very quiet – and makes it clear when I’m not.